I enjoy listening to classical music. However very seldom I listen to works by Mahler. There may be a few reasons for this. Firstly works by Mahler are usually very lengthy, and were recorded into 2-CD set. Also Mahler liked to compose his music with human voice. I prefer listening to instrumental much more to vocal. In fact the only classical music I like with vocal arrangement is Beethoven Symphony No. 9. Beethoven is the first composer to integrate vocal into symphony and being such a great work, one can hardly dislike the Symphony No. 9. 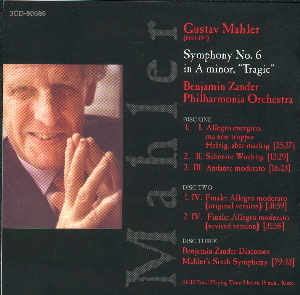 One day when I was browsing CDs in Tower Records, I heard this recording of Mahler Sixth. What made me bought the 3-CD Mahler Sixth Symphony Set was the explanation given by the conductor of the recording, Benjamin Zander. This is an interesting CD set though. For the price of 1 CD, you get three of them. This Telarc recording was played by Philharmonia Orchestra, conducted by Zander. Disc one is the recording of the first three movements, second disc is two versions of the last movement, and the third disc is Zander's very enlightening explanation of the Sixth Symphony. Just the explanation alone is almost 80mins, very useful to somebody who knows very little about Mahler and his music, like me. Benjamin Zander felt that the Sixth was the hardest to understand of all Mahler's Symphonies. Ironically it was also the most 'Classical' of Mahler: typical four movements, the first and the last movements were in sonata form, the inner movements consisted of a Scherzo and an Andante. This is a very long symphony, without any vocals. Both the opening movement and the last movement lasted more than 30mins, that alone is almost the total duration of other complete symphonies. Mahler Sixth is a very special work. But certainly not a very lovely work. Mahler's motive of writing this symphony sounds like a fairy tale to me, but also at the same time very eerie and strange. The four movements of the Sixth are: Allegro energico ma non troppo, Scherzo, Andante moderato and Finale. The stories of the movements themselves are interesting. After Mahler completed the symphony, he had doubts on the order of the 2nd and 3rd movement. Finally in the first performance, Mahler conducted the Andante, followed by the Scherzo. But for some reasons in the year 1963, the score of the critical edition of the International Mahler Society was published restoring the original order, Scherzo followed by andante. While the orchestra scores are printed in the sequence Scherzo-Andante, the instrument scores somehow remain as Andante-Scherzo. Thus when an orchestra is rehearsing Mahler Sixth for the first there might be some confusion. Other than the order of the 2nd and 3rd movement, Mahler also made some changes to the 3 hammer blows in the last movement. During the premier performance he reduced to 2 hammer blows. Mahler Sixth is probably the most complicated and the darkest of Mahler's works. It was composed during the summer in the year of 1903 and 1904, where Mahler was at the peak of his career. He was having his holiday during this two summers at Alps. He married the gifted and beautiful Alma in 1902. His two daughters were born in the year 1902 and 1904. He was the music director of Imperial Court Opera in Vienna. Strange enough, he composed the darkest and the most helpless work during these sunny and energy filled summers. In fact during the same period he composed ‘Songs on the Deaths of Children’. It was not difficult to understand his newly wedded wife Alma was puzzling how Mahler ever composed songs of such nature for a new father with two healthy and happy daughters. What made things more amazing was the Symphony 6th seemed to prophet the death of Mahler himself. In the symphony there were plenty of death or fate motives. Surely enough, in the summer of 1907, Mahler was faced with three big blows. Firstly, his eldest daughter died of sickness. Next, the bitter end of his directorship with the Vienna Opera. Lastly, the hardest of all, he was diagnosed with fatal heart disease. These three blows to Mahler exactly reflected the 3 deadly blows in the last movement of his Sixth Symphony: "the hero is assaulted by three hammer-blows of fate, the last of which fells him as a tree is fell." Whether you believe these tales or not, Mahler Sixth is no doubt the darkest of all Mahler’s works. So deadly that the conductor Mahler himself was not able to face his own work. And therefore, the switch of the central movements, and the removal of the last hammer blow. 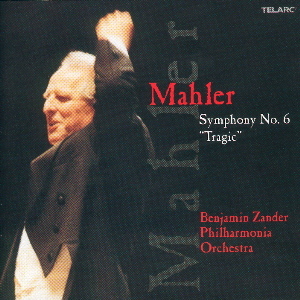 Benjamin Zander, the conductor of this Telarc recording of Mahler Sixth, however, did not agree to the final changes done by Mahler. It was probably the conductor Mahler who knew too well the composer Mahler that he made those changes on the premier to reduce the impact to himself. Let us look at the symphony itself. The first and second movement both begin with the dark A minor. The Scherzo movement in fact is sharing many motives with the first movement, but with more energy. So if the Scherzo is played immediately after the first movement, it is continuous and logical, and is able to make the audience out of breath. The Andante however begins with E flat major, which is the furthest away from A minor. The first 10 bars of the last movement in fact slowly moves from C minor back to A minor, also an possible indication that Andante should have been the original third movement. The first movement of Mahler Sixth, the Allegro energico ma non troppo, is written in clear sonata form. The movement begins with a short introduction, with bass sections repeatedly playing with accents at low A. The structure is typical of a sonata: following the introduction, are the exposition, development, recapitulation and a CODA. What Mahler did differently was the use of many short musical ideas and motives. Among them were two haunting fate motives. One of them was the forceful punch of A, the other was A major chord moving to A minor chord, symbolising from hopefulness to despair. At the end of the exposition section appeared a nice and continuous Alma theme. With this theme we heard hopefulness and love, a strong contrast to the previous short abruptive motives. Mahler repeated the exposition section, not common of him, maybe for the listeners to better digest the abundant and complicated musical materials presented. In the development section, real life cow bells were used in a low profile manner. This movement although was written in despair A minor key, the music finally ends with triumph Alma theme. The second movement essentially consists of a Scherzo and a Trio being played alternately. The Scherzo is dark, whereas the Trio is lively sort of like playful children. However, as the music goes on, the Trio gets weaker and weaker and finally disappeared totally towards the end of the movement. The Andante comparatively is much simpler to comprehend. It is made up of a thematic material presented in two contrasting manners. The movement begins with E flat major. Typical of Mahler, within the major key he inserted many accidentals and this major key is interrupted by series of minors. Cow bells again were used two times in this movement in a high key manner. However, the true meaning of these cow bells only the composer Mahler himself would know. The final movement is the conclusion of the struggle between the hero and the fate. Structurally this movement is very complicated. If the listener approaches from the sonata point of view he is most likely getting nowhere. Zander suggested approaching this last movement from the three deadly hammer blows. Although this symphony is named 'Tragic', the music itself is still essential positive, like a hero bravely fights against his fate. The music development of the last movement is like climbing a hill, slowly and steadily a climax is attained. However every time just after the climax there comes the deadly hammer blow. After the blow the music runs chaotic, but soon gets organized and moving forward to another climax, only again to be knocked down by the second blow. The music then again goes chaotic but reorganized again for the third time. This time there is a surprise. The music seems moving continuously to the climax and beyond, and you probably thinking that it is moving towards triumph. But at a moment that is least expected, there comes the final and the most deadly hammer blow, of which the hero is finally being fell, and the music slowly fades away. At the end of the music, the fate motif appears again loudly, but this time it is not from A major to A minor, but is straight into the tragic A minor chord. The recording of Benjamin Zander is value for money. For very good price you get recording of the complete symphony with full description from the conductor himself. Also two versions of the final movement were recorded. I have another version of Mahler Sixth conducted by Karajan with Berlin Philharmoniker. In the Karajan version, the performance was more forceful, and the musical structure was in my opinion more convincingly presented. Karajan also conducted the Scherzo, followed by the Andante. However, as with many other conductors, he did not wish to confront the 3 deadly hammer blows and instead the version with only 2 hammer blows were performed. Another difference is Zander placed the first and second violins on both sides of the orchestra whereas Karajan placed all the violins on the left side of the orchestra. Zander's arrangement allowed more details of the second violins to be heard and Karajan's arrangement allowed better bass presentation. Many people may think that works of Mahler are not easy to comprehend. Maybe if you were to listen to Zander's explanation of the Mahler Sixth, you may start to explore Mahler's works, and probably exploring what was deep in his heart.